On the coast of Riviera, in the heart of Nice, close to Place Massena - 54, Bd. Jean Jaurès - lies this beautiful apartment on the 3rd floor (WITH elevator and air conditioning) of a characteristic building. This apartment has a living room, relaxing place where you can relax, read, listen to music or watch TV and a dining room where can be trained at least 8 people. Both overlook a terrace with table and chairs overlooking herself on Place Massena. This apartment also has a large fully equipped kitchen including among others gas hob, multifunction oven (including microwave), refrigerator and freezer, dishwasher and washing machine. A dining table can be set for 6 seats. The apartment has a capacity of 5 people and includes a double bedroom with a double bed, a bedroom with two single beds (which can be combined into a double bed) and a room with a single bed. The apartment has a bathroom with a bathtub, sink, bidet and toilet and a bathroom with a shower, sink and toilet. This apartment features: - An en suite bathroom to double bedroom. It includes a bath, bidet, toilet, sink, a mirror, a table, a glass shelf, hairdryer. - A bathroom that overlooks the corridor leading to the living room or the bedrooms and has a shower, sink, toilet and two small glass shelves. The apartment has numerous cupboards including shelves and wardrobes. What more can we say..., we loved it !!! Right across from the colourful water spouts and Messina Squre, steps from shopping ,old and new, fresh food markets everyday, a plethora of eating establishments,beach is right down the street, need I say more..., Yes I do. A wonderfully decorated, lived in , home away from home feeling. Has my bathtub, full kitchen , 3 bdrms , and a wonderful terrace to relax on. Your host will be there for you if you have questions and really looks after the apartment. Would we go back ? In a second ! Thinking of booking now, you should too. Just don’t take our time....enjoy we did ! No better place to stay in all of Nice! This is my third stay at this apartment. It is the best location for everything. 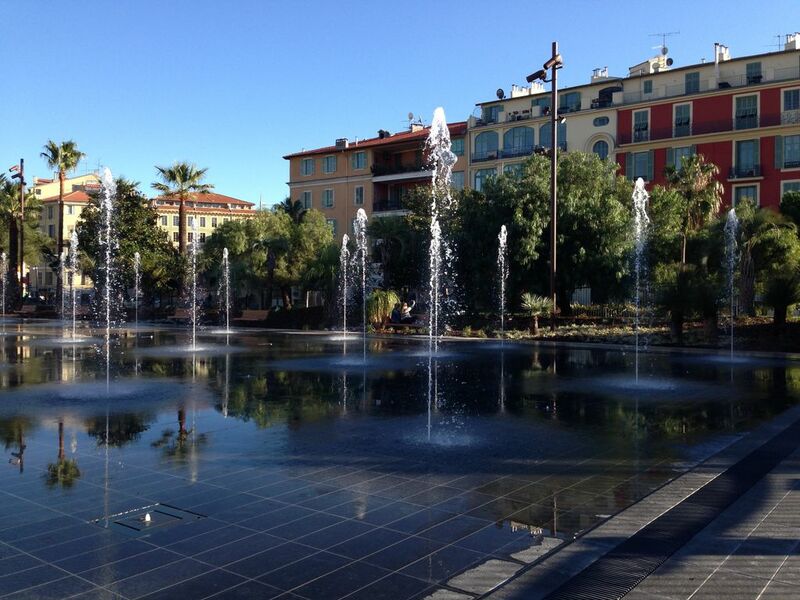 You have a lovely view of the park and Place Massena from the large terrace. The apartment is very comfortably furnished. There is so much room so 4 adults were very comfortable. We did not cook while there, but the kitchen is well supplied with everything you need to prepare a feast. It is more like a welcoming home than a rental unit. The hostess, Geraldine is always available for any problems, although there were none. There is a parking garage just a few steps away. You will be very happy there. Nice is Fabulous. Lovely apartment in a great central location. We would stay here again. We had everything we needed for a family of 5 with older children. Would definitely recommend. My husband and I stayed here for eight nights in October and had a wonderful time. The apartment could not be in a better location, overlooking Place Massena, a 2 or 3 minute walk to the old town. The bedrooms are in the back so they are very quiet. The terrace faces north, which means you can enjoy it all day without direct sunlight beating down on you. The kitchen was quite functional and once we figured out how to use the appliances we made several delicious meals with produce we bought at the nearby Cours Saleya. Between the large living room and terrace, there was plenty of room to spread out and relax. Geraldine was a delight to deal with. She met us at the apartment when we arrived in Nice, spent time showing us around the apartment, and then stayed in touch via email, always available if we had any questions. I have nothing negative to say about our experience and would gladly stay here again. Great flat, great location, great hostess. At least 5 minutes of this apartment are the Promenade des Anglais and its beaches, the old town with its shops and restaurants, the pedestrian and Avenue Jean Medecin and shops. The car is not a necessity as nearby are bus and tram. If necessary, the public car park Corvesy is located behind the building. The apartment is air conditioned in the third floor.